We took a two person apartment in early September. 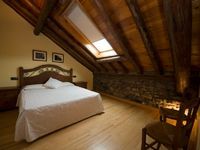 The apartment was spotless, very well equipped and well situated for the national Park, medieval Ainsa and other villages. Senora Ceresuela was very friendly as were other guests. We appreciated her gift of cake and doughnuts. The town of Fiscal has a shop which stocks most items. A few words of Spanish help. We found that with basic Spanish and goodwill the trip went well. We shall hope to return some day.